The recent ice storms caused some damage on my trees and shrubs. It wasn’t as bad as I thought it would be considering we had about a quarter of an inch of ice accumulation. I’ll need to do some extra pruning this spring to take out broken branches and that made me think about my pruning tools. I got out my box of pruners and took a look at the ones I use the most for pruning outdoors. They are in pretty good shape but they do need some sharpening. 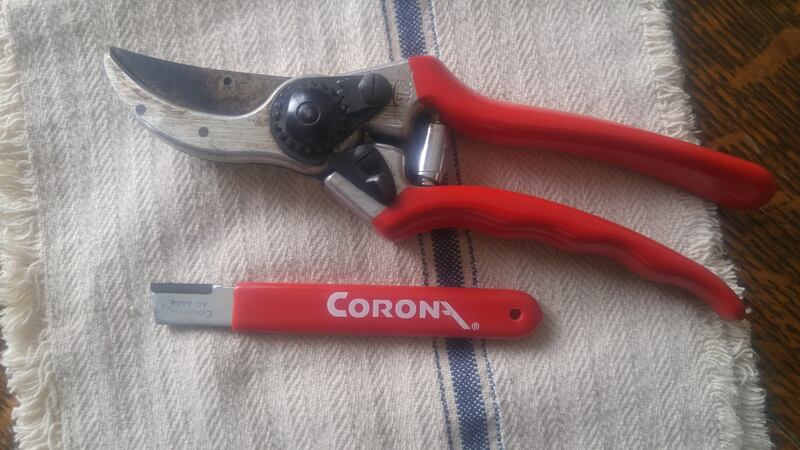 Years ago I bought a special sharpening tool designed for pruners from Corona Tools. It’s about about five inches long with a strip of carbide material brazed onto one end. The carbide is super hard so it can sharpen steel blades without ever getting worn out. One of my Felco pruners and Corona sharpening tool. I use both Corona and Felco pruners as well as others. The sharpening tool works on all brands of pruners and similar cutting tools. To use the sharpener, cradle the tool in one hand and draw the carbide toward yourself, over the length of the inside cutting edge bevel four or five times. Try to keep the angle of the tool at the angle of the original bevel. You don’t have to use much pressure. 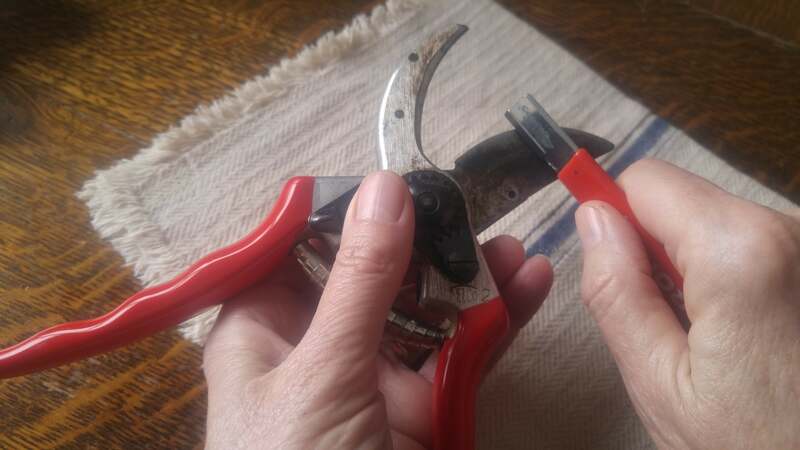 Grasp the pruners like this to avoid contact with the blade while sharpening. This grip also gives you better control of the sharpening tool. 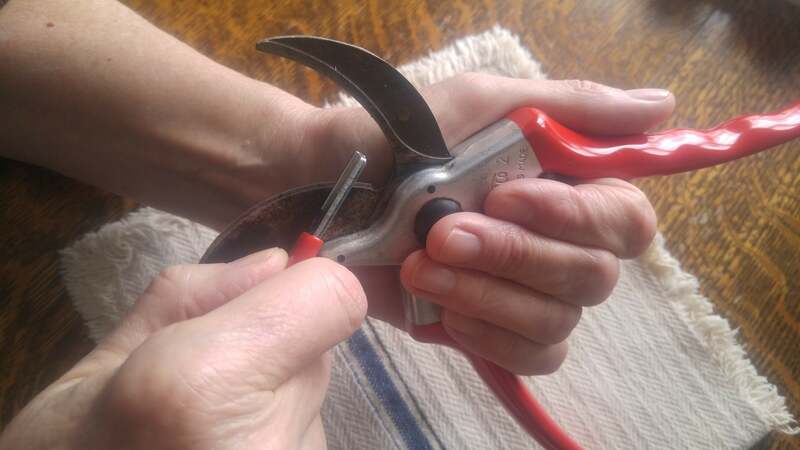 Then turn the pruner over, gripping it to avoid being cut and rub once across the flat outside edge. Keep the tool flat on the blade to avoid creating a new “micro-bevel”. That’s it, you’re done. A single pass straightens microscopic distortions on the cutting edge. I have several different small diamond files and others that I have used in the past and they work OK too, but I find the Corona tool is the easiest one to use. It is not designed to grind a new edge on damaged tools but it can be used to touch up the edges on loppers, shovels and other gardening tools. Be extra careful with loppers, their long handles make them a bit awkward to hold. I have 14 different pruners, snips and secateurs that I use for different purposes. Now would be a good time to get them all sharpened up before the pruning season gets here. A couple of posts ago I discussed a hands-off style of flower gardening that works sometimes in established gardens. In those cases the soil is usually in pretty good shape after having had plants growing in the same spot for many years. Not everyone is fortunate enough to have such a garden space. I’ve hoed a lot of long rows this season. Now it’s time to touch up the edge on my garden hoe. 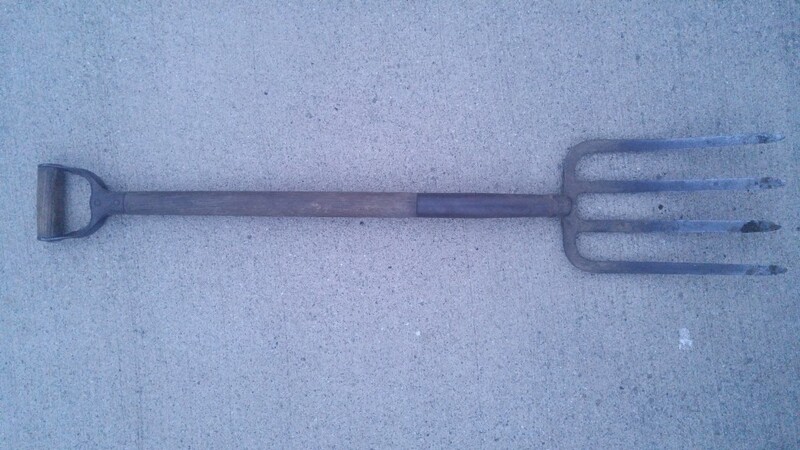 The hoe I’ve been using for more than 15 years is a Dutch made, swan-neck style. Its light-weight head combined with a curved shank makes it a pleasure to use. As an added bonus it has an extra long handle which makes easier for a taller guy like me to operate. I don’t have to bend over in an exhausting, awkward position to reach the ground. Nearly every hoe I’ve seen has the wrong bevel on the cutting edge. Right from the store, hoes often have a flat edge with no bevel at all. People take them home and immediately grind a sharp, angled bevel, like a wood chisel edge. That makes a very sharp edge but it does not last very long. It soon gets dull cutting through the soil. So gardeners end up working in their garden with a perpetually dull tool. The proper way to form an edge on a hoe is to file a curved profile on the back of the hoe blade i.e. the side facing away from you when you use it. Keep the front of the blade metal flat, don’t grind it. File the back of the blade, the side facing away from you when using the hoe. Imagine if you were to cut the blade in half with a hack-saw. Looking at the cross section of your blade edge with a microscope, you would see the front face ending at a right angle while the back face curves to meet the front edge. Most of the wear on a hoe blade happens on the back side of the blade edge. A rounded back edge leaves much more metal on the side of the edge that is prone to wearing down. You won’t be able to shave with that edge but it will last much, much longer in the garden. Heat mats last a long time if used properly and are carefully stored. I own a lot of different kind of gardening tools. The most unusual one has to be my hand-held rotary hoe. The single star is the front of the hoe. The handle pivots to allow the tool to be pushed or pulled. Farmers have been using large rotary hoes for decades. These are non-powered tools, not to be confused with rotary tillers. They were especially popular in the days before chemical herbicides came into wide-spread use. The design is basically a series of specially shaped discs mounted side by side on an axle 10 or 12 feet wide. There are different configurations; some discs are star-shaped, others have small spoon-shaped ends attached around the circumference of the disc. To use a rotary hoe, the farmer pulls the hoe behand a tractor at a fairly fast speed. The star points enter into the soil at about 90 degrees — straight down. As it moves forward and rotates, the point leaves the soil at an angle lifting some soil at the same time. This lifting action pulls up germinating weeds. It is the weeds you don’t see — those still underground — that get destroyed. By the time you see the first leaves poking up out of the soil, it is almost too late to rotary hoe. A rotary hoe in action runs right over everything in its path — the crop plants as well as the weeds. The crop plant, usually corn, is well-rooted and can’t be yanked out by the hoe. The leaves get torn up in the process but the corn plant recovers quickly. Chemical herbicides, increasing labor costs, and high fuel prices caused most farmers to abandon their rotary hoe years ago. Many organic farmers still use them however. My little hoe is a just a scaled-down version of those large, farm implements. It actually works quite well whenever I remember to use it early enough. What’s your most unusual gardening tool? There are a lot of different ways to sow seeds into a garden bed. Sometimes I use a hoe to form a shallow trench, then drop the seeds in. Other times I use my finger to poke a hole into the soil before dropping in the seed. I find as I get older, my finger has a tendency to get pretty tired if there are a lot of seeds to sow. This week I finally decided to do something about it; I went into my woodworking shop a made a couple of traditional tools called dibblers — sometimes also known as dibbles or dibbers. These tools are used to make holes for planting seeds. It took just a few minuets on the lathe to turn a couple of different sized dibbers from a piece of scrap cherry wood. Most of the dibbers you see for sale on line and in the gardening catalogs have very sharp points. The description usually says something about how easy it is to penetrate hard soil with a metal-clad point. It occurs to me that if you prepared your planting bed properly, you wouldn’t need a sharp point. I left the business end of my dibblers somewhat blunt. My garden soil is friable so it doesn’t take much effort to poke a hole. The blunt end also leaves extra space at the bottom of the hole for the seed to rest at the proper depth. It does make it more difficult to kill vampires, however. If you need more space for a seedling transplant or plug, the tapered shape allows a hole to be widened by rotating the dibber in a circular motion. I suppose I could have just whittled a piece of broom stick with my pocket knife but this is a much more elegant and versatile tool. I looked at the calendar a couple of days ago and realized March is almost here. Since March is always so busy, I planned to get all of my garden equipment in shape by the end of February. The last big project is the rotary tiller — its carburetor needs work. My deadline for fixing the carburetor on my tiller has arrived. I’ve rebuilt a few small engine carburetors in the past. I’ve even done a couple of auto carbs years ago, so I have a good idea of what it’s all about. I’m convinced that anyone with a mechanical aptitude and the ability to follow written instructions, can do this job. It takes a positive attitude and some time. For those who have no idea where to start, I put together a summary of the steps involved. It may convince you to take your equipment to the shop instead. On the other hand, it may inspire you to take the plunge and give it a try. Remember, if you can’t get it to work, you can always take it into the shop later. In the meantime, it will give you a chance to try something new– and an excuse to use that new tool set you bought. I did catch a little break — February has 29 days this year. That gives me an extra day to finish repairing that tiller before my deadline passes.